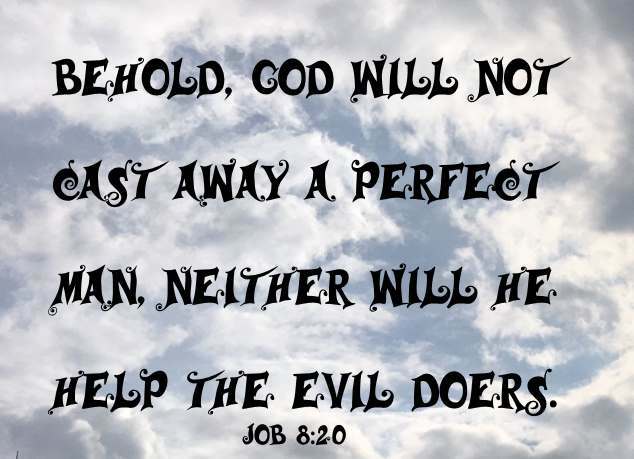 Behold, God will not cast away a perfect man, neither will he help the evil doers (Job 8:20). This verse alone points us to being perfect in God's eyes as He will always help the perfect person, not casting us away. The Hebrew word "tam" translated as” perfect” means “complete, morally innocent, having integrity". The Greek word "teleios" used in the NT means, “fully mature, complete, brought to its end, finished”. The phrase “perfect man” appears 4 times in KJV – Job 8:20, Psalm 37:37, Ephesians 4:13 and James 3:2. The question is "How do we become a perfect person in the eyes of God?" To be clear, we are not talking about worldly perfection. An example of worldly perfection would be the ancient Greeks who implemented the Olympic Games and ever since then athletes have been trying to break records. Or how about science, technology and medicine over the centuries: continually striving to advance, to improve for perfection, but as we are well aware, technology becomes obsolete in a few months, cars still rust and airplanes still crash and cancer, AIDS and other life threatening diseases are on the increase, instead of decreasing. What has happened though is that continued improvement in the secular world has increased our comfort and our style of living, but unfortunately, mankind has left his spiritual development behind in pursuit of this secular development. The truth is that we cannot hope for perfection without having a relationship with God and His Word. My brethren, let not many of you become teachers, knowing that we shall receive a stricter judgment. For we all stumble in many things. If anyone does not stumble in word, he is a perfect man, able also to bridle the whole body (James 3:1-2 NKJV). From this scripture, it is undeniable that a perfect man does not offend others by what he says and has the ability to "self-control" (bridle) his entire body. As stated above, the Greek word for “perfect” used in the New Testament means, “fully mature, complete, brought to its end, finished”. Certainly one mark of maturity must be our ability to control the way we use our tongues. Used incorrectly, our speech may betray the condition of our hearts and our maturity level. In fact, our speech can bring out spiritual defects in our lives. Behold, we put bits in the horses' mouths, that they may obey us; and we turn about their whole body (James 3:3). We all know that by holding the reins attached to the bit, we can turn a horse or make it stop even though the horse is much stronger and heavier than us. Likewise our tongues, that only weigh a few ounces, can be in control of our whole body. As the rider controls the horse with a bit, we can control our bodies by controlling our tongues. It is the Lord who is in control. Behold also the ships, which though they be so great, and are driven of fierce winds, yet are they turned about with a very small helm, whithersoever the governor listeth (James 3:4). The Apostle Paul often took passage in ships during his missionary journeys. It was necessary to properly steer these ships by using the helm to avoid rocks and storms and stay on course. Paul said that he spent a day and a night in the deep after suffering a shipwreck. Improper use of our tongues can definitely lead us to our own spiritual shipwreck. We would do well to take the advice of the wise men who found a star and followed it until they came to where Jesus was, and there they offered gifts and worshiped Him with their tongues. Even so the tongue is a little member, and boasteth great things. Behold, how great a matter a little fire kindleth. And the tongue is a fire, a world of iniquity: so is the tongue among our members, that it defileth the whole body, and setteth on fire the course of nature; and it is set on fire of hell (James 3:5,6). A brother offended is harder to be won than a strong city: and their contentions are like the bars of a castle (Proverbs 18:19). Do not ye yet understand, that whatsoever entereth in at the mouth goeth into the belly, and is cast out into the draught. But those things which proceed out of the mouth come forth from the heart; and they defile the man. For out of the heart proceed evil thoughts, murders, adulteries, fornications, thefts, false witness, blasphemies: These are the things which defile a man: but to eat with unwashen hands defileth not a man (Matthew 15:17-20). The unruly tongue is the devil’s workshop and satan is NOT slow to fan its flames. In fact he adds fuel to the fire by using the diabolical tools of deception and the spreading of half-truths. For every kind of beasts, and of birds, and of serpents, and of things in the sea, is tamed, and hath been tamed of mankind (James 3:7). 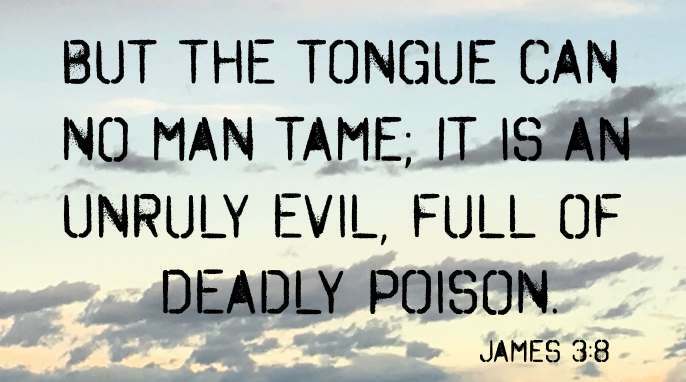 But the tongue can no man tame; it is an unruly evil, full of deadly poison (James 3:8). Since we cannot tame our tongue, we ask then "how can we be this perfect man"? We can only accomplish perfection by following the advice that a master navigator would give a novice on how to sail: “Don’t look all the time at the compass – find a star and steer your ship toward that star”. Yes indeed, for us it is the Bright and Morning Star. We should aim our ship at Jesus, steer it toward Him and He will guide us to the port of Heaven. We should concentrate on developing Christ-like character. We need to always pray to be more like Jesus and not all like us. The only good in us comes from Him. Only when our hearts are pure, will that which emanates from the tongue be also pure, moving us along the path to become a perfect man. Therewith bless we God, even the Father; and therewith curse we men, which are made after the similitude of God. Out of the same mouth proceedeth blessing and cursing. My brethren, these things ought not so to be. Doth a fountain send forth at the same place sweet water and bitter? Can the fig tree, my brethren, bear olive berries? either a vine, figs? so can no fountain both yield salt water and fresh (James 3:9-12). A fountain spouting out sweet water and bitter water at the same time. A fig tree bearing olives. A grape vine bearing figs. A spring to produce both fresh and salt water. These natural phenomena can only produce to their nature. Similarly, a Christian who blesses God and curses his fellow believer has a serious heart problem that he should bring to the Divine Heart Surgeon for healing. What Does Cursing Look Like? Wherefore laying aside all malice, and all guile, and hypocrisies, and envies, and all evil speakings (1 Peter 2:1). The cursing tongue is akin to that of the liar, the scorner, the talebearer, the false witness and the flatterer. Let us pray that we never have a cursing tongue. What is the tongue really for? Every Christian should strive to use the tongue as a blessing. To bless someone is to speak gratefully or to confer prosperity or happiness upon someone. So if a person always looks for ways to bless others, he will become addicted to finding the good in others, and ultimately he will become positive in his approach to life itself, becoming a perfect man. Her children arise up, and call her blessed; her husband also, and he praiseth her (Proverbs 31:28). The disciplined tongue can be a help to others, what we really have in this case is "the fruit of the tongue". It is through the tongue that we receive most of our preaching and teaching. It is with the tongue that the church glorifies the Lord and sings praises to Him. A mother uses her tongue to calm her fretful child with the sound of her gentle voice. The tongue of a diplomat may promote trading between nations, or stop a war. The Spirit filled tongue is able to pray for the sick or witness to souls who have lost their way and desperately need Jesus. Let us pray that God helps us to use our tongues in this manner at all times. 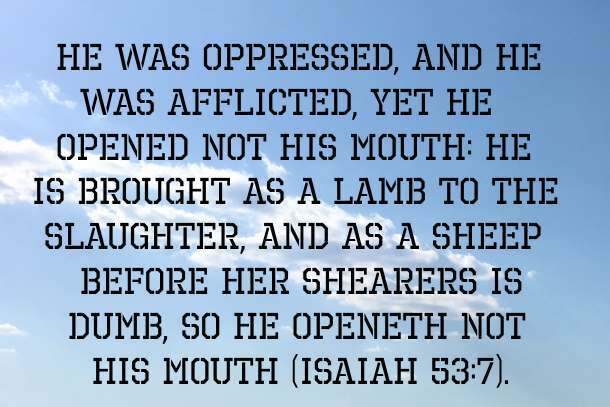 He was oppressed, and he was afflicted, yet he opened not his mouth: he is brought as a lamb to the slaughter, and as a sheep before her shearers is dumb, so he openeth not his mouth (Isaiah 53:7). And what happened? Pilate marveled that Jesus answered nothing (Mark 15:5). The Lord tamed the tongues of the upper room believers on the day of Pentecost when he filled them with His Spirit. And they were all filled with the Holy Ghost, and began to speak with other tongues, as the Spirit gave them utterance (Acts 2:4 ). For the promise is unto you, and to your children, and to all that are afar off, even as many as the Lord our God shall call (Acts 2:39). In other words, when the Lord calls an individual, He promises the person the Holy Ghost, which gives the person the power to purify his heart and his tongue, becoming a perfect man. The tongue is small like the bit in a horse’s mouth, or the rudder at the back of a large ocean liner, yet it is capable of controlling the entire body and even initiating a series of events that could lead one either to heaven or to hell. The tongue has the power to stir emotions to a point where people lose their tempers and even suffer physical illnesses such as high blood pressure, stroke, stress, anxiety and ulcers. Mankind can tame the most vicious of beasts but he cannot tame the tongue. Only God can do that as the believer submits himself to God, surrendering himself completely, thereby permitting the Lord to fill him with the Holy Ghost. When the Lord fills the believer, he will speak in other tongues as the Spirit gives utterance (Acts 2:4), thereby allowing the Lord to tame his natural tongue and become a perfect man. Truly the tongue can be a blessing or a curse. Although one has the power to bless others, too often people unfortunately use the tongue to bring about a curse. Even the Christian can be guilty of cursing when he uses his tongue to flatter, slander, or repeat gossip. On the other hand, he can be a blessing, when he uses his voice to be gentle, kind, true, loving, and temperate.